Want faster, more efficient renders and/or better lighting? I know many of you already know of, and even have this book. 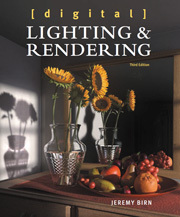 But being a new reader of it, I am adamant that anyone whom might want or need help with lighting and/or rendering in 3D software should read this book! JAY_NOLA has been trying to get me to get this book since we've first met here in the forum. Garstor decided to buy the book and along with his order, he sent one to me as well... Thank you, Garstor!!! Talk about the gift that keeps giving! Here's the thing. While I would never call myself a master at it, not yet anyways, I feel fairly confident in my lighting and rendering techniques. I do have unanswered questions, but those questions don't seem to come up much. Perhaps it's from all of those years painting and sculpting - studying art throughout my life. With Carrara's really easy to work with lights, I just feel comfortable lighting my scenes. I have been pushing myself to continue my fight to try and keep my render times as fast as possible - because I'm in the for animation. The stills that you may see from me from time to time are usually just some test shot from an animation - and likely was rendered at very low accuracy settings. So I'm no stranger to tinkering with my render settings either - but due to wanting to remain fast for animations, I have accidentally ignored many options available to me. Even more, there are a good many things about a render engine that I'm not too sure about, and some that I haven't a clue about. Well in this book Jeremy is taking me on a wonderful, easy to follow tour through all of this and much more! The style of his teaching is enjoyable, fast to read and understand, and he's a true master at the craft - yet he understands how to begin telling someone whom may have no clue. I have a long way to read before I'm done. I am not a very fast reader. But this book has me captivated! It really does feel refreshing to get into a book like this, and find that my comfort level was not just some coincidence as my lighting techniques are not off the mark at all. Beyond my life experiences that I've mentioned earlier, this community has helped me by vast measure towards learning my way around some of the ins and outs of various lighting solutions in Carrara. Tim Payne, evilproducer, Dimension Theory, 3dage, magaremoto, and many others have shown me many tips and tricks, and Koukotsu (where is she, anyways... off killing stuff or saving people in Skyrim, or something?) has introduced me to Ambient Occlusion. She uses AO to great success, in my opinion. I never really knew what that process was truly doing until I just read about it in this book. Truly great and important things to know, that I now have a complete understanding of, without a need to return to that chapter, where yesterday I had not much of a clue about it at all! Very good to know stuff. Learning from someone like this is very nifty. He's been there. He's had to meet those deadlines, fix those light leaks, get more performance out using whatever he had at his disposal to work with, and now he has such a practical understanding of it all, that he can also teach us some of the cutting edge, latest stuff to know about these topics. Like I said... his teaching style is very good. Check the link above and have a look at some of the sample material - I believe he has some up there to try. Jeremy Birn is a Lighting Technical Director at Pixar Animation Studios, where he has lit shots in the movies Monsters University, Brave, Cars 2, Toy Story 3, Up, WALL-E, Ratatouille, Cars and The Incredibles. Prior to joining Pixar in 2002, Jeremy did lighting and rendering at such companies as Palomar Pictures, Wild Brain, CBS Television, and Tippett Studio, where he worked on effects for the feature film Evolution. Jeremy has taught courses at the California Institute of the Arts in Southern California and the Academy of Art University in San Francisco. Digital Lighting & Rendering is "non-software-specific," but that doesn't mean it's just a bunch of useless theories! The book is written from the point of view of a very experienced professional, and shares production-proven techniques that are useful in almost any 3D rendering package. The book describes professional ways to light and render a scene, and includes many notes about specific software when appropriate. Cheats, work-arounds and old-school solutions are included as alternatives for techniques which might not be accessable to some users. Even for compositing techniques, examples are shown that work in Photoshop (as well as examples in Nuke) so even someone who doesn't have compositing software yet can start putting together render layers and passes in the ways described in the book. This book isn't just about how to adjust the look of your renderings, it's also about why. What do you look for? How do you tell good lighting from bad? Chapter one starts with visual goals of lighting design, the motivations for light sources, and walks step-by-step through how lighting designers cheat to achieve the results they want. When and how to start the process of lighting during a production, how to choose between all the types of lights in your 3D program, adjusting controls and options on lights. Updated with new examples: IES physically based lights, objects as light sources, etc. Creating different looks with shadows. Controlling raytraced hard and soft shadows from different types of lights. Depth map shadows, how to fix bias and framing issues, fixing light leaks and artifacts. New coverage of occlusion sandwich technique and occlusion passes with displacement and reflections. Cheats and tricks to fake and manipulate shadows and occlusion. Lighting sets and environments with natural light or artificial lights, by day or night. New examples of spill light, global illumination techniques, simulating global illumination, breaking up spaces with varied lighting, working with volumetric fog and atmosphere, new focus on underwater lighting. Creating different looks in character lighting; how to light characters in motion and follow emotional shifts in scenes. Adjusting key, spill, bounce, fill, rim, and kick lights to model characters with light. Strategies for developing character lighting rigs and lighting multiple characters. Mixing character lighting with set lights and global illumination. Tips and examples for lighting and rendering character eyes, skin shading and subsurface scattering, and lighting character hair. Understanding exposure on real cameras: f-stops, shutter speed, shutter angle, the zone system, how to shoot images to create HDRI. Matching with live-action cinematography and simulating camera artifacts in 3D: matching depth of field, new detail about adjusting bokeh effects, motion blur, lens breathing, chromatic aberrations, and lens distortion. Planning cinematic productions using different types of shots, using realistic camera rigs to simulate convincing camera moves, planning shots that will cut together well when edited, working in different digital and film formats and aspect ratios, using lighting to help improve your composition and enhance visual storytelling. New focus on the linear workflow, how to avoid problems with gamma and colorspaces, and why the linear workflow matters in lighting and compositing. Creating a compelling scene through developing a consistent color scheme. Understanding digital color, from the sRGB standard to bit depth and OpenEXR half-floats. The meanings of different colors, and using color to influence the emotional impact of a scene. Simulating a film color balance and matching Kelvin color temperatures for real light sources. Explore the basic components of materials and shaders, different kinds of shaders, and what kinds of looks you can create. Understanding vocabulary such as diffuse, glossy, specular, BRDF, BSSRDF, energy conservation and physically based shaders. Different kinds of rendering algorithms: Reyes, raytracers, approaches to global illumination, and unbiased renderers. This chapter features examples of many types of mapping, the differences between displacement, bump mapping, normal mapping, and polynomial texture mapping, different strategies for alignment between maps and geometry such as UV maps, projections, and Ptex, and tutorials on creating texture maps, equalizing levels to create better tiling maps. This chapter will be available on-line as a free download. Approaches to splitting your scenes into render layers and render passes, how to recreate a complete scene from rendered elements, and the benefits to the looks development process of multi-pass rendering and compositing. Using straight vs. pre-multiplied alpha channels. Compositing examples updated to use Nuke (Shake examples replaced) as well as work-arounds in Photoshop that anyone can follow. Compositing with a linear workflow. How feature films move through a multi-department production pipeline for visual effects or animated feature production. Understanding what all the departments do, how lighting fits in with the larger pipeline, and how lighting TD's put together assets from many departments in building a shot. New focus on strategies such as lighting key shots, referencing, and sharing light rigs that let multiple lighters efficiently collaborate to light feature films and other larger projects. Question: "I already have the Second Edition. What's new and different in the Third edition?" The third edition is longer and more detailed, and every chapter has been re-written. There's a more modern approach to many topics, such as starting with a linear workflow and why that matters, and including technology like ptex and unbiased renderers. Modern software is used in examples and the chapters are full of new figures from new sample scenes. Besides technology-driven changes, many topics have been improved through re-writing and new exercises and examples,showing in-depth approaches to underwater scenes, creating different looks with bokeh, and detailed discussions of professional approaches to collaborating and sharing work on larger productions such as animated features. Thank you, Garstor... I am eternally grateful. Of course, there are many great points being made constantly throughout this amazing tome. But one in particular that I've expressed over and over regarding lighting and choice of software: if you cannot get good lighting in one software, do not blame the software - as you'll likely not get good lighting in any other. I used my own wording here, but the point remains the same. In seeing some of his examples, though, we certainly can see differences in what you can do in the lights from some software that is not available in Carrara. But then he includes work-arounds for software that does not include the feature he's mentioning - and so far in reading all of these work-arounds can be easily done using Carrara features. I really enjoy how I find myself learning a much deeper understanding into why this works and that should be avoided. The why of things. Sure, I might have hit my mark pretty nicely on some of my lighting setups, but he's helping me learn so much more. Right now I am feeling a major urge to experiment with Ambient Occlusion. Not knowing exactly what it is makes it difficult to set up. Well, perhaps not that difficult in Carrara, since the folks that set up the defaults have a good understanding of how it does work. But in order to successfully set up true use of the feature, taking full advantage of its potential, knowing what it does and the proper thought process behind setting it up specifically for what I'm rendering is key. Jeremy offers homework assignments to further embed knowledge into our workflow. The web address that he offers in his book gives us another forum and downloads to help us share our progress with others of all skill levels - again, an essential process in learning. This stuff uses both science and art to make the most of the best possible outcome. Jeremy had to learn the science of all of this but now he is very effective at passing along this knowledge in a more layman language, without being condescending. This is awesome! Just bought the Kindle edition for my iPad, a steal at £6.80, and I can view the images full size as well. Always wanted this book as well, but it was a bit pricey, now I have it, thanks for the reminder Dart. I have the German issue of the second edition. I don't want to miss it. I would be happy if the new one also would be available in German soon. This is a book that I have been interested in getting for ages, and with the Third Edition being released, it was what I needed to push me into it, and I got it as soon as it came out. Highly recommended! I know I harp on about it, but it supports what I have been saying about gamma and linear workflow too! And coming from such an expert as Jeremy Birn, you simply have to sit up and take notice. Some very useful little tips scattered through the book as well. Need to get myself a copy asap! It is an amazing book I did earn a lot from it and did apply the information in Carrara. It has help me a lot. ...and it's not some boring numbers book, even though I really like boring instruction manuals, no... this is one heck of an entertaining course. I say 'course' because you learn so much, so quickly, that it feels like a college education. I guess that, since we're learning from a master in the field, one that teaches at college level and has been through this stuff in the real world, we really are... to a point. Water is a material rather than a lighting issue, and it depends on what you mean by water, there are lots of different types of water image and you may need different settings for each - a close-up render of a water droplet is going to be very different from an ocean. If you can be more specific in your question, I am sure there will be lots who can offer advice. I found AOA lighting, uberenvrionment2 are quite good for producing quality output while speeding up the rendering. "Water" is simply too vague, so I'm going to guess: a lake of water. For that, since we're only talking about lighting, not the water setup, I like to use the same lighting as I would for other renders, especially as taught by Jeremy in the book of the thread title, with the Rim light glancing the peaks of the waves causing them to stand out in the render a lot more than the rest, which is very transparent as well as reflective and refractive, and that makes for some beautiful water! Jeremy talks about three-point lighting, which is a highly popular and proven method of lighting for photography, so that makes it a great technique in 3D as well. The "Rim" light is a light which comes in from behind the subject at super-bright levels, like 300 or even higher. Since learning more on this I've seen a lot of examples of folks using a from-behind Key light and calling it a Rim. The Rim is not meant to be cast over and onto the subject. The Rim is supposed to be just a fine line. A good way to tell is to actually turn that light's brightness to 500 and see if it wrecks your image. If it does, adjust it some more so that it forms a nice, thin outline on that side of the subject... same with water. That being said, one of my favorite things to do with water in Carrara is to hit it from behind with a low placed Sun light, causing a sunrise or sunset across the water... and Carrara does a beautiful job of it! Even it these cases, go ahead and crank that Sun light's brightness up a bit. In this example, It's almost more like a from-behind Key than a Rim, depending upon the angle. In either case, use the idea of a bright Key or a Rim to really highlight the edges of the ripples or waves. Regarding the setup just a bit, for lakes and rivers I like to keep the wave amplitude fairly low - most of the time under 1ft. with as high of a resolution as I can get before my working view starts to bog down... then back off a notch or two. Perhaps set it back up again for the final render. Both of those working together will give nice, crisp wave tip edges to take advantage of your lighting. Turn all lights off in the scene. If you're using the Sun light as a Rim (or not... regardless) turn it off too. Now Insert a new Distant Light and set it to face the camera almost level with the water, lifting the back of the light just slightly to angle it down towards the camera, but still keeping it mostly flat along the ground plane. Crank the brightness up to 300. Set the light to "Only" affect the water, nothing else. Now shoot a test render. Work on the angle of this light until you get it creating just a thin, bright accent to the waves. Now turn the rest of your lights back on and have a look. Adjust the brightness of your new water-rim according to the needs of the image! I hope this gives you some inspiration to make some cool renders to show off! I wanna see! The water is just a flattened vertex cube, with the lake water shader applied. Tango, that looks great but for one thing - because you have it set to only light the water, it looks like it is shining through the building, which impacts the realism, but I agree, it is a nice effect. We have magic buildings round here! ;) I noticed but let it slide cos it was only really a test render, and waaay past bed time! I'll let you off - just this once!